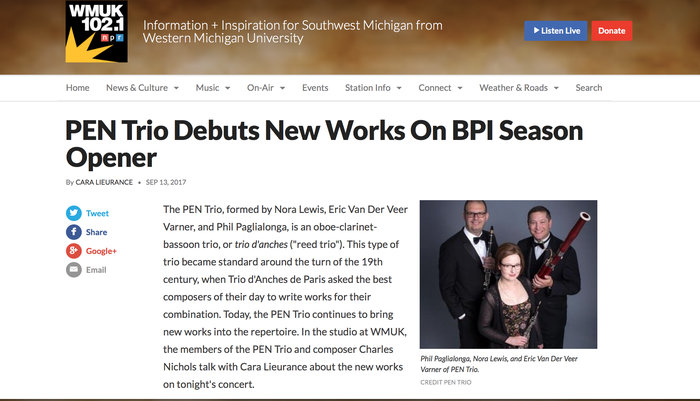 The PEN Trio bridges performance and scholarship to explore and expand the repertoire for the traditional trio d’anches. The ensemble regularly tours throughout North America and abroad and has become known for the quality and energy of their performances. 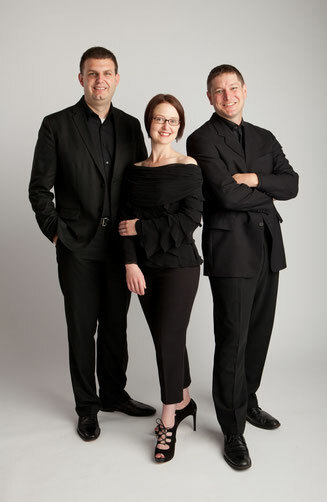 The PEN Triohas visited dozens of universities and has performed at numerous academic conferences, chamber music series, and private functions. Recent highlights include featured performances at the annual conferences of the International Double Reed Society, College Music Society and National Association of College Wind and Percussion Instructors, as well as performances on Michigan and Alabama Public Radio. Their 2015 season includes performances in China, Hong Kong and Trinidad as well as tours in Florida and Texas. In June the group records their debut album, "Found Objects" in New York City with Boston-based Sound Mirror. The album will include new works, written expressly for the ensemble, by William Bradbury, Jenni Brandon, M. Shawn Hundley and Aleks Sternfeld-Dunn with an anticipated commercial release in 2016. The group was recently awarded funding from the Blumenthal Foundation to complete a weeklong residency at Wildacres Retreat in North Carolina in August to study and rehearse works by Lutosławski and Martinů. Louise Dyer-Hanson, founder of the publishing company Éditions de l'Oiseau-Lyre, heard the group in its early days and quickly became enamored with the sound of the ensemble. Consequently, she helped the group commission several new works from leading composers that were eventually published by Éditions de l'Oiseau-Lyre. Ultimately, this group of pieces was published together as a collection that is still in print today. The Trio d'Anches de Paris had nearly a dozen works written for and dedicated to the ensemble, including compositions by Bozza, Franck, Ibert, Milhaud, and Tomasi, which now forms the core of the standard repertoire. The PEN Trio was formed, in many ways, to continue the work that the Trio d'Anches de Paris began nearly one hundred years ago. Since 2010 the PEN Trio has premiered works by William Bradbury, Jenni Brandon, Allen Cohen, Jon Grier, M. Shawn Hundley, Peter James Learn and Aleks Sternfeld-Dunn, and has promoted these works in concert around the world. In 2013, the PEN Trio partnered with Trevor Cramer and TrevCo-Publishing to create the PEN Trio Collection. This collection includes new works as well as new editions of existing works to make the trio d'anches more accessible to musicians around the globe.